Although Bangkok might have previously been known for inexpensive lagers and vodka buckets, the Thai capital has now earned a splendid reputation for being one of the best cocktail cities in Asia. Today, there are plenty of cocktail bars in Bangkok helmed by award-winning mixologists and bartenders who have a passion for the craft of cocktails. And there is no doubt that much of the city’s bar culture emerged from restaurants and bars within luxury hotels. An American invention, the craft cocktail fluctuated in popularity following the prohibition era and has definitely altered the culinary landscape. Inspired by the 1920s, Hotel Muse Bangkok isn’t just another boutique hotel in another city. 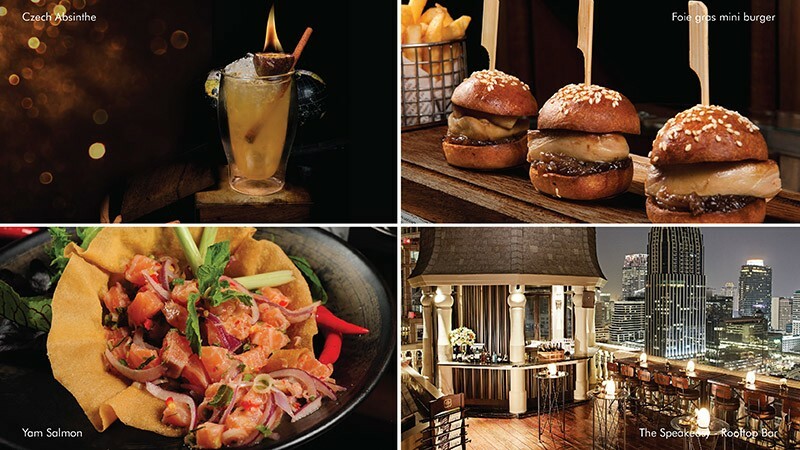 Set up in the sophisticated neighborhood of Chidlom, the hotel has placed much effort in reviving the cocktail scene of the prohibition era by creating the iconic cocktail bar in Bangkok: The Speakeasy Rooftop Bar. Peaked with a golden dome against the sky, Hotel Muse Bangkok houses The Speakeasy Rooftop Bar which offers well-made drinks and an inviting atmosphere. Boasting spectacular skyline views, The Speakeasy Rooftop Bar is a multi-level bar that takes up the 24th and 25th floor of Hotel Muse Bangkok. Drawing inspirations from the hidden bars from the yesteryears of America, The Speakeasy Rooftop Bar is a cozy cocktail bar in Bangkok that can’t be found anywhere else. It captures a certain essence of the City of Angels — let it be bitter, sweet or sour. Anyone familiar with hidden speakeasies in America might wonder how the mysterious vibe can translate into a bar inside a hotel. Perched on a steep rise with vintage touches and dramatic balconies, The Speakeasy Rooftop Bar is designed to resemble a hidden hangout for artists and poets of the olden days. With sumptuous sofa seating, soft candlelight on polished wooden furnishings and secret nooks at every corner, this cocktail bar in Bangkok is not only an in-depth craft cocktail experience, but also an al fresco space for small bites and daytime drinking. For those who enjoy high-quality Cuban cigars will be delighted to know that there are three private rooms if you would like to indulge in a puff and a sip in exclusivity. Unsurprisingly, The Speakeasy Rooftop Bar boasts stunning views of Bangkok’s incredible skyline and city lights. Here, you’ll find that this cocktail bar in Bangkok attracts a varied crowd, from well-heeled locals and modern travelers to longtime expats. With a craft cocktail in hand, everyone is sipping the evening away and mingling with one another under the star constellations. Ardently creative and attention to detail, our mixologist Lersak Jamkadsin has garnered a reputation among cocktail aficionados in Bangkok. With a wealth of knowledge in classic cocktails, Lersak also has a flair for creating new and exciting concoctions that are unique to The Speakeasy Rooftop Bar. 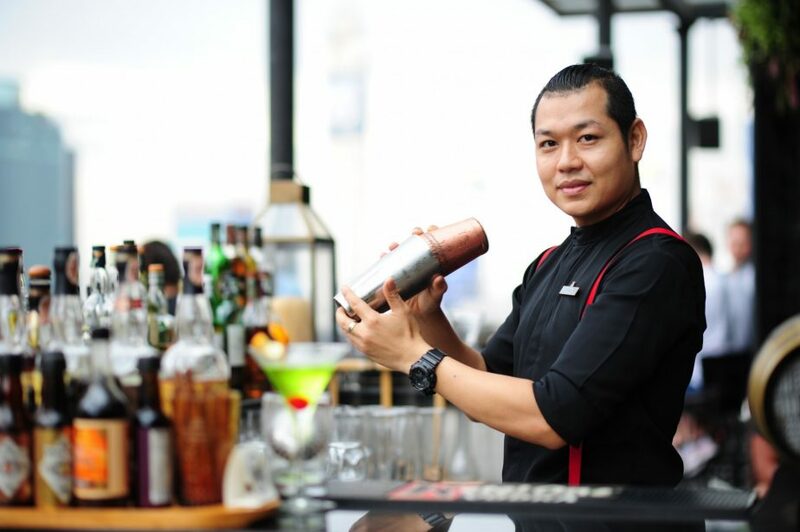 Certified and recognized by a number of prestigious industry associations — Diageo Thailand, the Bole Academy and Wine & Spirit Education Trust —Lersak is extremely passionate and adept in creative cocktails. Combining intriguing ingredients and his expertise in cocktails, he has created a menu that is one of a kind for our cocktail bar in Bangkok. The Speakeasy Rooftop Bar showcases all manner of cocktails, from sweet and refreshing to bitter and captivating. The key idea is to create something singular, unique and balanced with house-made preparations. While you can ask for classic cocktails such as martini, sazerac, or negroni, you can also ask our mixologist Lersak Jamkadsin to create a craft cocktail catered to your personal tastes. To enhance the atmosphere of the prohibition era back in the 1920s, we serve cocktails in jam jars and select quality spirits to reinvent classics. The Speakeasy Rooftop Bar emphasizes on gin creations. With a dedicated Gin Library, this cocktail bar in Bangkok showcases a collection of 75 different premium gins from around the globe. 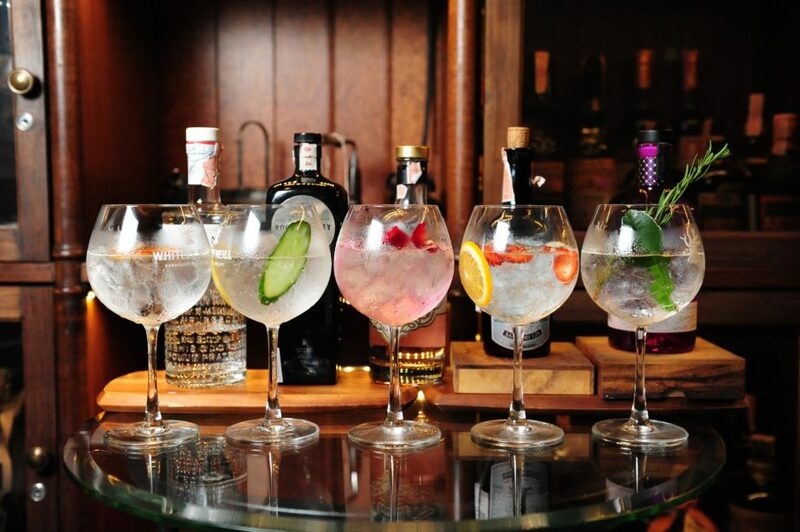 Catering to every discerning palate, the Gin Library lets you select from a wide range of differing gins and tonic with varying infusions. This includes cucumber-, lychee- and apple-infused gin, as well as gin cocktails that are shaken with butterfly pea and aloe vera juice and finished with tonic. You’ll definitely find a gin and tonic that suits you. Aside from gins and tonic, there is also a lush selection of craft cocktails that are inspired by Bangkok and highlights local spirits from Thailand. For instance, there is a series of Chalong Bay cocktails that Chalong Bay rum. This includes a refreshing Lemongrass Mojito, which is a mix of local rum, fresh lime juice and fresh mint and a splash of soda. The Shake the Passion is a tangy swirl of Thai basil-infused rum, honey, fresh lime and passion fruit. For those who are more adventurous can try genuine sips of the Wasabi Martini, which consists of gin-unfused green tea, elderflower syrup, wasabi and lime. All of the classic and creative cocktails can be paired with Asian-fusion bites such as garlic prawn and juicy burger sliders. The bar menu at our cocktail bar in Bangkok is intended for sharing, encouraging guests to nibble and mingle in a casual and inviting atmosphere. With frequent dining offers, The Speakeasy Rooftop Bar welcomes new and loyal guests to take advantage of sweet deals. Designed like a sophisticated hidden bar, The Speakeasy Rooftop Bar is an inviting setting. The rooftop is full of character, ideal for cocktail enthusiasts with a discerning and open-minded palate. Here, travelers will want to invest in the unique drink experience, and couples or small groups will enjoy celebrating a special occasion.